Sinulog! It is that time of the year when pilgrims from different walks of life and different parts of the Philippines make their yearly journey to the Basílica Minore del Santo Niño in Cebu City. Hundreds and thousands of people flock to the oldest Roman Catholic Church in the Philippines, commonly known as Santo Niño Church, and in the process we can witness a transformation both physically and spiritually. The 360 streetview below shows how the Pilgrim Center looks on a normal day. During Sunday masses, this can get filled but on a manageable situation. But during Sinulog, things are different. The Santo Niño Church Pilgrim Center transforms into a place of reds and yellows. From the banderitas up above to the drapes and flowers around, you can experience the biggest feast of the Senyor Santo Niño. And speaking of Senyor Santo Niño, you will definitely see a lot of the Holy Child image inside that comes in different sizes and colors. Rain or shine, devotees keep their ground and unfazed. As they say, the Filipino faith is waterproof. Though you can always use your umbrella or the ones provided by the church colored in red and yellow. Are you amazed? 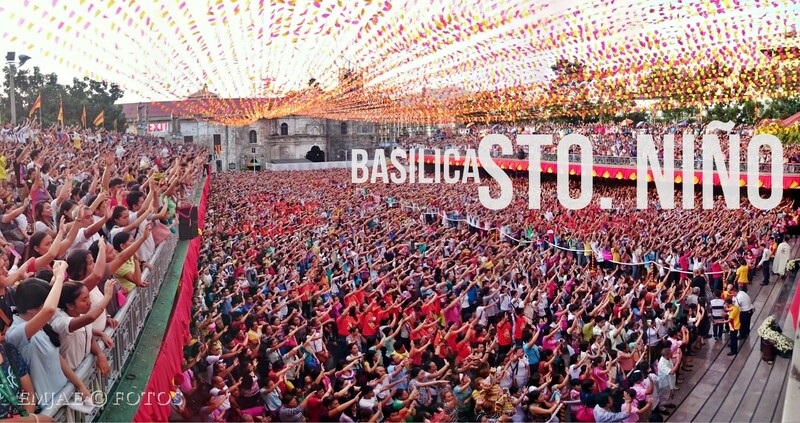 Wait until you witness hundreds of hands swaying in the air while singing the Gozos to Senyor Santo Niño, the Batobalani sa Gugma (Magnet of Love). This is the “chorus” of the song, the time to sway your hands to the Sto. Niño and the best time to offer your praises and thanksgiving to the Child Jesus for his mercy and love. It gives me goosebumps all the time. The very short clip (taken from my phone) below shows you how the crowd transforms like a sea of hands waving back and forth in unison. Sometimes when I’m down and troubled, this part brings tears to my eyes. And before the mass finally ends, you will hear this chant from the priest or the reader and the people will respond the same while raising their hands up. Viva Pit Senyor! It means to call upon or plead to the Senyor Sto. Nino. Great photos Emjae! As always!